When you make a reservation, you will receive a rental confirmation/Invoice from us requesting your deposit on the accommodation you have booked with Room By Room. The rental confirmation becomes a binding agreement when you send us your rental deposit; it states the terms and conditions concerning the accommodation rental between you, (the guest) and Room by Room Co. Ltd. Your sending payment in response to this invoice constitutes your acceptance and agreement to these terms, conditions, limitations and restrictions as printed below. If you have any problems or questions with any of the following, please be sure to phone or e-mail for discussion and explanation before you send us your rental deposit monies. 50% of the rental amount is due WITHIN 7 DAYS of booking to confirm your reservation. Failure to make this payment subjects your reservation to automatic cancellation without notice to you. The balance due of rent and damage deposits must be paid in full in cash on arrival. All cancellations and any request for changes to your reservations (such as date changes) must be made IN WRITING. 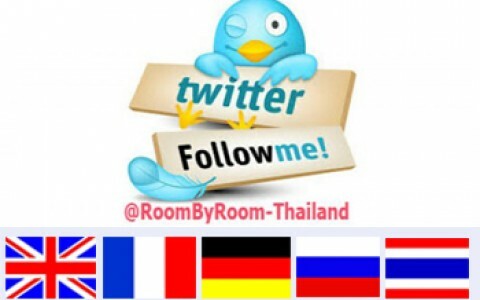 If you cancel your reservation all deposits received will be retained by Room By Room Co., Ltd.
Account Name: Room By Room Co. Ltd. Please state your full details and depositors’ name so that transactions can be recognised easily. All Transfer fees will be charged to the buyer. Balance of rent and refundable deposits are payable on arrival. Damage deposits (of 20,000.00 THB unless quoted differnetly) are fully refundable on the day of your departure, provided there is no breakage, damage, missing items, no additional cleaning for property left abnormally dirty, long/short distance calls charged to the property telephone and no other charges incurred before, during or after your stay, still outstanding. Electricity and water charges apply and shall be deducted from your utilities deposit on your departure rates for the property are charged at supplier’s price per unit for both water and electricity; rates for condominiums vary depending on the meters used. You hereby agree to pay Room By Room Co. Ltd. on behalf of the owner of your property for the cleaning or replacement costs for all damages to personal or to the real estate, which may occur as a result of your occupancy, excluding normal wear & tear. You as the guest agree to take all reasonable steps to ensure that your family and other guests in your party adhere to the rules and regulations affecting your villa. All properties are privately owned, so décor, color and inventories will vary. Removing or rearranging the furniture is prohibited. Room By Room Co. Ltd is acting hereunder as the agent for accommodations, and assumes no liability for property loss or damages, nor liability for injury, accidents, delay, or irregularity which may be occasioned either by reason of defect in any vehicle or the acts of any company or persons engaged in conveying passengers to or from their property. The guest is responsible for his property during occupancy, must lock all windows and doors securely at all times when not on the premises, and must exercise care in securing all personal property. All Room By Room accommodation is privately owned. The accommodation owner and Room By Room reserve all rights refuse service or rentals to anyone at their complete discretion. Pets of any kind are NOT allowed in or on the accommodation premises without specific permission from Room By Room (Granted prior to arrival). A pet or evidence of a pet found on the premises will cause for immediate eviction, and forfeiture of the guests entire rent & deposit. Room By Room shall make every effort to keep all villas and their inventories in good working order. In case of a maintenance problem, they will strive to repair the problem as soon as possible after being notified. However, no refund or rate adjustment shall be made for unforeseen mechanical failures such as the supply of electricity, telephone service, water, pool filtration systems, Jacuzzis, air conditioning, television or cable service, internet service, appliances, etc. It is the guest’s obligation to report any problems or damage to their accommodation IMMEDIATELY to us, regardless of the hour. Guests must check in/out during office hours. Guests who require check ins/outs out of office hours shall incur a surcharge of 500 THB. +66849282192 or Jean Marc Conrad +66926891313. THERE ARE NO CHECK INS/OUTS BETWEEN 10:00 pm AND 06:00 am. *EMERGENCY check in/out between 10 pm - 6 am :- if there is an agent available, we can arrange this. An additional Charge of 3,000.00 THB is made for this service. It has to be authorized in advance by the Rental Manager. офиса компании Room By Room. в 500 бат встречающему или провожающему вас сотруднику компании. ночное время составляет 3000 бат. Room by Room or its staff may enter the property to perform any repairs as necessary. If your property is on the market for sale, we reserve the right to allow the property to be shown, but only by advance appointment made with guests. We will make every effort to schedule such brief showings at a time convenient to you, to respect your privacy, and not interrupt your stay. Room By Room reserves the right to substitute comparable or better accommodation without liability, should the property reserved be sold, be out of order, been inadvertently double-booked, or be deemed substandard by us for any reason. If comparable accommodations are not available, guest may receive a complete refund of all pro rated rent for the accommodation. Guest and members of his/her party shall not use or permit to be brought into the property any illegal substances, inflammable liquids (e.g. gasoline, kerosene, naphtha or benzene), or other explosives or articles deemed hazardous to life, limb or property. Room By Room shall charge 1000 baht for each set of lost or mishandled keys; gate remote controls will be charged at the replacement cost. All guests are required to follow all instructions precisely on where to leave your property keys and remote keys upon departure call office if you are unsure. Room By Room wishes to maintain a family atmosphere for the quiet enjoyment of guests. We rent to family groups and responsible adults only; absolutely NO house parties or functions such as weddings are allowed without advance written permission, failing to do so will lead to forfeiting the entire property security deposit to the accommodation owner, at the joint discretion of Room By Room and the accommodation owner. The information pertaining to each accommodation in Room by Rooms Website was correct at the time of printing and our website is constantly updated. Room By Room is not responsible for printing errors or inadvertent omissions. All rates and property details are subject to change without prior notice. In any dispute arising out of this rent agreement, the laws of Kingdom of Thailand shall apply and the prevailing party shall recover its costs, expenses and reasonable legal fees. YOUR SENDING PAYMENT IN RESPONSE TO THIS INVOICE CONSTITUTES YOUR ACCEPTANCE AND AGREEMENT TO THESE TERMS, LIMITATIONS AND RESTRICTIONS. If you have any problems or questions with an of the preceding, please be sure to e-mail or phone us BEFORE you send us your rental deposit monies.